Resident Evil’s enemies have evolved in parallel to the series’ pacing: They started off slow, shambling, and scary with the first three before breaking into an all-out run by the fourth and fifth. Resident Evil 6 typical enemies, called J’avo, grow tentacle arms, claw hands, and massive moth wings mid-battle as their limbs are blown off. They’re annoying and remarkable--and yes, that’s about as good an analogy for Resident Evil 6 as you’re going to get. Resident Evil 6 shuns the series’ standard narrative path in favor of containing three different, consecutive cooperative campaigns following a viral threat on a global scale. 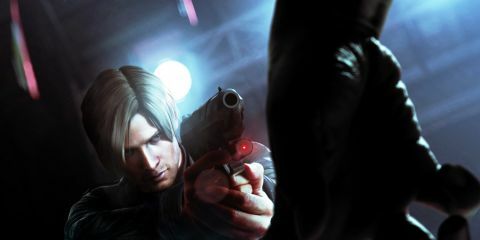 Leon Kennedy teams up with agent Helena Harper to deal with the G-virus as it breaks out in a small American town in one campaign, Chris Redfield and Piers Nivans fight Bio Organic Weapons as they spread through China in another, and Jake Muller and Sherry Birkin attempt to escape mercenaries and mutants in Eastern Europe in the third. There’s also a fourth--following Ada Wong--that is unlocked after the other three are completed, though the first trio can be handled in any order the player wishes. Though all of the campaigns feel similar in terms of their basic components and pacing, they all have their own styles and idiosyncrasies. To put it in the plainest terms possible, Leon’s plays like an action-heavy Resident Evil, Chris’s plays like a Resident Evil military shooter, and Jake’s plays like a more cinematic, Uncharted-inspired Resident Evil. None play all that much like a traditional Resident Evil, or even an RE4/5 era game--they’re much faster and more explosive, trading fear for gunfire without actually addressing the fact that it’s no longer a survival horror game. The split campaign works well for the most part, and does a great job of creating a massive, epic story without making each character feel like a super soldier. Capcom did a fantastic job of keeping each segment separate while still including instances that help flesh out the plot of the other campaigns and add context to situations. Instead of feeling like different chapters of the same story, Resident Evil 6’s campaigns feel like stand-alone experiences complemented by the existence of other, related moments. That said, it can also create a somewhat uneven game when played straight through, as you’ll be met with four introductions, four climaxes, and four conclusions, as well as a fair share of repeated plot points and gameplay mechanics. Some things, like the new skill and experience system, transfer between, but otherwise they're their own beasts. Fans of shorter single-player stories will undoubtedly enjoy the ability to blow through any of the campaigns in five to seven hours, whereas those who prefer longer narratives will still be greeted with a single tale that lasts around 25 hours. That’s over two-dozen hours without digging into The Mercenaries, a score-grind mode; Agent Hunt, a feature that lets you jump into the body of an enemy in a stranger’s game; or attempting to go back through cooperatively or to hunt down all of the hidden Serpent emblems. Better yet, the campaigns occasionally cross over into the others as the different plotlines converge and diverge, creating some of the most memorable moments the series has seen in years. These aren’t just cutscenes, either--when you play as Leon you’ll run into a section where you’ll fight side-by-side with Chris, prompting the game to search for players currently playing Chris’s campaign to pull into your game (after a brief, skippable waiting period). Intertwining stories can mean brief, fleeting segments of four-player co-op interspersed throughout, making RE6’s already grand, overarching story feel more impressive. It also means, however, that some battles or moments are repeated in later campaigns, which can be an issue if the segment wasn’t all that good in the first place. Repetition is common during RE6’s many boss battles, where stories overlap the most--and the encounters only become more tedious every time you replay them. It’s not because of the actual mechanics of the gameplay, though--those are stronger in RE6 than they have been in any of the past games. Resident Evil 6 sports the largest upgrades to the Resident Evil style since RE4. An emphasis is placed on fluidity and movement--a huge departure from the tank-like controls of previous games. The welcome ability to move and shoot is joined by sliding, crawling, upgraded melee, and a cover system that never seems to work right (but, thankfully, is never really necessary). There are still some moments of slowly plodding through moody corridors, waiting for enemies to leap out and scream, but they’re weaved between cinematic moments and large-scale shootouts. The issue, though, is with conflicted gameplay; more specifically, scarcity of ammo and an annoying inventory system. Resident Evil 6 doesn’t blend horror and explosive action, it simply sits awkwardly between them, leaving you with facing too many enemies with too few bullets. Needing to mix herbs and pick and choose which items to collect might have made sense in the past, but now it feels somewhat redundant, held back even more by inventory management that doesn't fit. You’ll often face situations that seem bred specifically to trick you into wasting ammo (and time), such as near-immortal enemies that need a cutscene to trigger before they can be harmed. These segments aren’t well telegraphed, and it’s often hard to know if the foe you’re wasting precious ammo on can be hurt at all, or if the game is simply biding its time until a quick-time event is triggered. Quick-time events aren’t new to the series, but they were used much more sparingly in the past than they are in RE6. Now everything from opening a door to punching an enemy has the potential to trigger an event that’ll have you slamming random buttons or smacking the analog stick back and forth. Sometimes they’re simply annoying, and other times they’re overly difficult. Never, though, are they enjoyable, and it's a shame to see interesting moments that might have served better as cutscenes or fully interactive segments be chained to QTEs. So much of Resident Evil 6 is wonderful. The story is intense and ambitious, and the separate campaigns--and the way they interact with each other--is an achievement in interactive storytelling. Even the changes to the gameplay are strong, and you’ll likely spend a majority of the game enjoying the weird, unexpected ride that it takes you on. When you do run into issues, though, they’ll be related to the half measures taken in other areas of the gameplay, proving that flat-out abandoning some tropes while clinging on to others doesn’t always make for great sequels. Though rough around the edges, Resident Evil 6 is still a remarkable creature, and like the J’avo, it’s an interesting transformation, even if it’s not necessarily the prettiest one. Description Resident Evil 6 is the most ambitious Resident Evil yet.